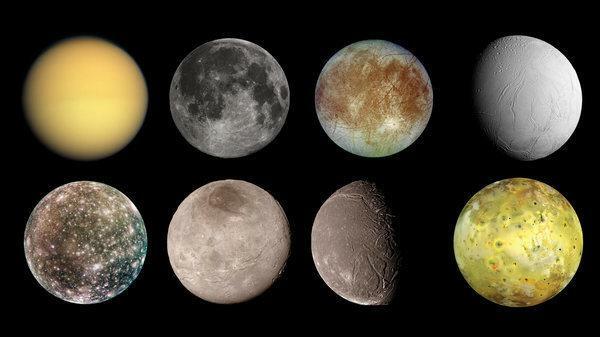 (Top row, from left) Titan, Earth's moon, Europa and Enceladus. (Bottom row, from left) Callisto, Charon, Ariel and lo. Still, he and colleague Alex Teachey say in the journal Science Advances that they have good evidence that a Neptune-size moon is orbiting a Jupiter-like planet, in a solar system about 8,000 light-years away. That planet, called Kepler-1625b, is one of thousands that scientists have recently detected around distant stars. No one, however, has ever conclusively found an alien moon. Kipping has spent the past decade or so working to do just that. He points out that our moon — the one with the astronaut footprints — does more than just inspire poets. Earth's companion keeps our planet's tilt stable and affects the tides. "When we look for an Earth twin, I think one of the most obvious things you might ask is, 'Does it have a moon twin,' because that seems to have a large influence," he notes. And when E.T. phones home, there's no reason that home couldn't be a moon. "That's been a key driver for us for a while, just trying to understand the cosmic habitats out there that we might look for, for life," says Kipping. After all, even in our own solar system, some of the most intriguing places to search for life are moons like Enceladus and Europa, which seem to have oceans of water beneath their icy crusts. A couple of years ago, Kipping and Teachey began scrutinizing data collected by NASA's planet-hunting Kepler space telescope. They checked about 300 planets for any weirdness that might mean a moon. What popped out was Kepler-1625b. "We didn't think we had enough to claim a discovery," says Kipping. "But we did think it was interesting enough to try to get more data on." Now the researchers say that what Hubble saw seems to confirm the idea that this planet has a moon. "We're still not 100 percent sure about that, but we think it is the leading hypothesis," says Kipping. Hubble watched the star as the planet passed in front of it, blocking some of its light. The planet appeared to make its transit earlier than expected, suggesting that the gravity of something was tugging on it. What's more, the telescope detected an additional decrease in the star's brightness after the planet's crossing was complete, suggesting that a Neptune-size moon was in front of the star. "The first exomoon is obviously an extraordinary claim and it requires extraordinary evidence," Teachey told reporters in a teleconference organized by the journal that published the findings. "Furthermore, the size we've calculated for this moon, about the size of Neptune, has hardly been anticipated and so that, too, is reason to be careful here." "If this does pan out and turn into a true discovery, it would be really revolutionary, but I don't think we're quite there yet," says Megan Bedell, an astronomer at the Flatiron Institute in New York. Moons are kind of the next frontier when it comes to understanding alien solar systems, says Bedell: "They capture our imagination." Planet-hunting missions like Kepler, she notes, have found plenty of gas giants orbiting stars at a cozy distance. "We think that they're at the right temperature to have liquid water on the surface, but of course there is no real surface because they are gas giant planets. So if they had terrestrial moons around them, then those would be habitable worlds," says Bedell. If this possible moon can't be confirmed, she says new planet-finding missions mean that before too long, scientists should be in a better position to find moons — if they're out there. Planets seem to be quite common, so it seems likely that moons should be common, too. All the planets in our solar system except Mercury and Venus have moons. "I think the real question is not whether they exist," says Kipping, "but how big do they get?" Thousands of planets have been detected around faraway stars in recent years. And now scientists studying those planets may have found the first moon. NPR's Nell Greenfieldboyce reports. NELL GREENFIELDBOYCE, BYLINE: Even in our own solar system, some of the most intriguing places to hunt for life are moons, like Enceladus and Europa around Saturn and Jupiter. These moons seem to have oceans of water beneath an icy crust. It's been hard enough to find planets around distant stars, let alone moons. Still, David Kipping thinks he's finally found really good evidence for one. DAVID KIPPING: The fact is it's so strange, and it's the first of its kind. That demands a higher level of rigor and skepticism than you would normally apply to a run-of-the-mill detection. GREENFIELDBOYCE: Kipping is an astronomer at Columbia University. He points out that our moon - the one with the astronaut footprints - isn't just a pretty face. It keeps our planet's tilt stable. It affects the tides. KIPPING: So when we look for an Earth twin, I think one of the most obvious things you might ask is, does it have a moon twin, because that seems to have a large influence. GREENFIELDBOYCE: What's more - he wants to find moons because when E.T. calls home, there's no reason home couldn't be a moon. KIPPING: That's been a key driver for us for a while, just trying to understand the cosmic habitats out there that we might look for for life. GREENFIELDBOYCE: A couple years ago, he and a colleague named Alex Teachey began scrutinizing data collected by NASA's Kepler space telescope. They checked around 300 planets for any weirdness that might mean a moon. What popped out was a planet called Kepler-1625b, a Jupiter-sized world that orbits a star around 8,000 light-years away. They followed up with the Hubble Space Telescope. And today, in the journal Science Advances, they say this gas giant appears to have a Neptune-sized moon. KIPPING: We're still not 100 percent sure about that, but we think it's the leading hypothesis. GREENFIELDBOYCE: The researchers have requested more time on Hubble to do more observations next May. MEGAN BEDELL: If this does pan out and turn into a true discovery, it would be really revolutionary. GREENFIELDBOYCE: Megan Bedell is an astronomer at the Flatiron Institute in New York. She says moons are kind of the next frontier when it comes to understanding alien solar systems. GREENFIELDBOYCE: She says if this moon can't be confirmed, new telescopes mean that before too long, scientists should be in a better position to find real moons if they're out there. Nell Greenfieldboyce, NPR News. (SOUNDBITE OF MECO SONG, "MOONDANCER") Transcript provided by NPR, Copyright NPR.